Caption reads: If there's need for an expert artificer in iron at the machine shop of the Pennsylvania Sugar Company, Delaware Ave. and Shackamaxon St., they call John-the-Blacksmith. He has the know-how that's necessary to fashion parts needed to keep the elaborate machinery of a big sugar house in operation. John-the-Blacksmith's name is John Kantisky. Born in Poland, he has been an employee of Pennsylvania Sugar Company for many years. 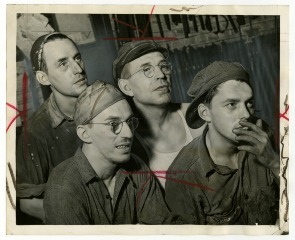 Three of Kantisky's four sons work for [the company]. John and Frank are sheet metal workers; Joe is a welder.